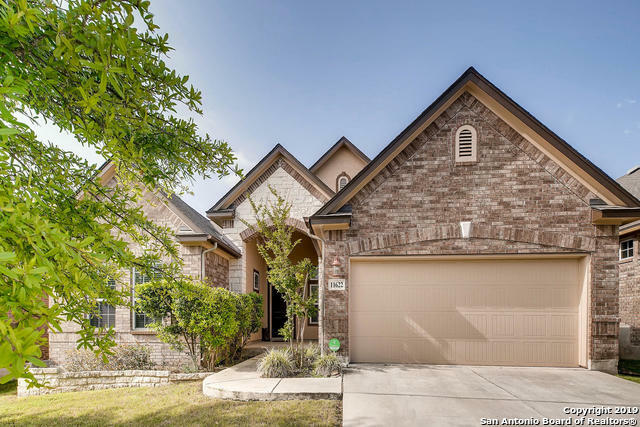 All TRAILS AT ALAMO RANCH homes currently listed for sale in San Antonio as of 04/26/2019 are shown below. You can change the search criteria at any time by pressing the 'Change Search' button below. "*OPEN HOUSE 3/24 2-4pm*Stunning 4bd/3.5bth on over 1/4 acre corner in gated community. Soaring ceilings & open floor plan, formal dining room, huge family room w/fireplace & large windows. Chef's kitchen w/gas cooking, granite, large island, lots of storage, breakfast nook. Master has bay windows, dual vanities, separate tub/shower, walk-in closet. Generous secondary bedrooms & laundry room. Game room w/wet bar& study alcove & separate theater room. Huge backyard. Amenities include pool, tennis"
"Beautiful 1.5 story, Alamo Ranch home nestled in the Trails gated community off Lone Star Pkwy. Split layout with all bedrooms down/Bonus room up! Soaring ceilings, SS appliances, granite, tile, carpet; Kitchen Mohen faucet, gas FP; 1 year-old water softener & dishwasher. In-ground sprinklers (front/back), covered deck. Security system, garage storage racks & much more. Easy access to UTSA, Lackland, USAA, La Cantera, The Rim. Don't miss this jewel!" "This home exudes the perfect combination of elegance and comfort. Great Flow ,An abundance of Kitchen cabinets is a fantastic extra. Downstairs office with a modern feel and a white washed Fireplace are just a few details that make this home not like the others. The split master is perfect for privacy and the Bonus Game/family room upstairs gives so many options. Plus,All bedrooms downstairs!"